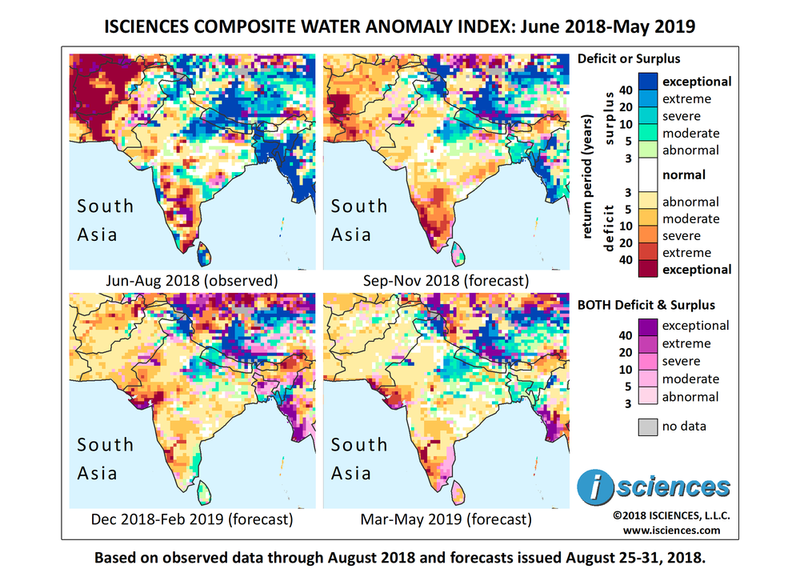 The 12-month forecast through April 2019 indicates intense water deficits in southern India, in Afghanistan’s northern half, and in southwestern Afghanistan reaching into Pakistan. Deficits are also expected to be intense near Karachi, Pakistan. Moderate to severe deficits are forecast in northern Gujarat, India and in Arunachal Pradesh in India’s Far Northeast. Surpluses ranging from severe to exceptional are forecast for Jammu and Kashmir, Uttar Pradesh, Manipur, Tripura, and Mizoram, India; Nepal; and Bangladesh. Surpluses of lesser intensity are expected along rivers in northern Pakistan, pockets of central India and West Bengal. The forecast through November indicates that widespread exceptional deficits that have dominated Afghanistan in recent months will retreat to the southwest, leaving moderate to severe deficits in the rest of the country. Deficits in southwestern Pakistan will downgrade slightly from exceptional to severe or extreme. In India, intense deficits are forecast in the southern third of the country with exceptional deficits in pockets of the southwest through Karnataka and Kerala. Moderate to severe deficits are forecast in Odisha and Arunachal Pradesh, and moderate deficits in Gujarat. Though exceptional surpluses will generally downgrade, fairly intense conditions are forecast for Jammu and Kashmir, Uttar Pradesh, Manipur, Tripura, and Mizoram in India, and Nepal and Bangladesh. Surpluses are expected to be extreme in Uttar Pradesh. From December to February deficit conditions in Afghanistan and Pakistan will moderate overall, though conditions may be severe along the Harirud and Helmand Rivers in western Afghanistan and exceptional in the northeast. In India, deficits in the south will moderate overall, but remain extreme in west-central Karnataka and along the Tungabhadra River. Severe to exceptional deficits will emerge in Gujarat. Deficits in Arunachal Pradesh will spread and become more intense, and primarily moderate deficits will emerge elsewhere in India’s Far Northeast and in Bhutan. Surpluses in Uttar Pradesh will diminish slightly but remain severe to extreme; surpluses in Nepal will retreat to the west; and, moderate surpluses will emerge along India’s southeastern coast and will persist in pockets of Sri Lanka. Bangladesh will begin to transition away from surplus except in the south, as will Indian states to the east. The forecast for the final period – March through May – indicates that deficits in Afghanistan and Pakistan will downgrade to mild but intense deficits may re-emerge near Karachi. The anomaly pattern for the remainder of the region will be similar to the prior three-month forecast, but with surpluses re-emerging in Bangladesh and a transition from moderate deficits to moderate surplus along the Ganges in Bihar. The carnage from recent months’ flooding in the southern Indian state of Kerala is transforming into breeding grounds for the infectious disease leptospirosis, or “rat fever.” At least 34 people have died apparently from the disease since last month. Last month’s flooding in Kerala, the state’s worst in a century, killed almost 500 people and forced one million from their homes, destroying buildings, infrastructure, and farmland along the way. Insurance experts in India are expecting reinsurance premiums to rise following the catastrophic flooding. Economic losses from the flooding are currently estimated at over USD$3 billion. Last month’s deluge was preceded by drought that was equally extreme. Rain levels started dropping in the monsoon season of 2016 and the dearth continued into early 2017, affecting 200,000 farmers. Hundreds of wildfires raged in the state, destroying thousands of acres of forest. The western Indian state of Maharashtra is undergoing a “trigger one” level drought assessment, meaning either that rainfall has been 50 percent less than normal, or no rainfall has come for 21 to 28 days. Declaration of drought is still questionable, and officials are hopeful that the remainder of monsoon season will deliver adequate moisture. Kerala’s neighboring state Karnataka is suffering both flood and drought conditions simultaneously. At least 16 districts have reported deficient rainfall, while others are being processed for flood relief. Extreme drought in parts of Afghanistan drove over 150,000 people from their homes into informal settlements, according to the United Nations. The Office for the Coordination of Humanitarian Affairs reported concern over a spike in early marriages and child labor among internally-displaced persons, of which there are over 300,000 in 6 of the 20 drought-hit provinces.